Trinitrotoluene (TNT) is a common explosive used in both military and industrial settings. Its convenient handling properties and explosive strength make it a common choice in explosives. TNT can be appear as yellow crystals or a solid block after melt-casting. Several tests are available for detecting TNT residues. Each test gives results as a simple, easy-to-understand color change. The photo to the left shows detection of TNT using ChemSee’s Nitro-Pen. This test was performed by U.S. Military personnel. Notice a dark purple color forms on the Nitro-Pen due to the presence of TNT. Testing for TNT can be completed in less than three minutes using the Nitro-Pen. ChemSee offers portable detection kits for explosives and explosive precursors. All Kits contain multiple detectors for specific types of explosives. Additionally, individual detectors can be purchased to refill the Kit after use. 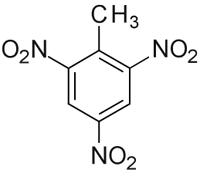 Trinitrotoluene has several trade names and may be listed as: 2,4,6-trinitrotoluene, tnt, trinitrotoluene, C6H2(NO2)3CH3, Trilite, Tolite, Trinol, Trotyl, Tritolo, Tritolol, Triton, Tritone or Trotol. All of ChemSee’s detectors and tests for TNT use color-based detection and give results instantly. All detectors use well-known, proven chemistries for detecting Trinitrotoluene.